When Bob Moyer isn’t traveling in physical terms, he’s traveling through his reading. Here, he visits Paris by way of a charming mystery. MURDER BELOW MONTPARNASSE. By Cara Black. SOHO Crime. 336 pages. $25.95. Cara Black has carved a comfortable niche out of the soft-boiled genre. She rambles around Paris, concocting mysteries that she derives from the historical context and culture of each arrondissement, as Paris neighborhoods are called. 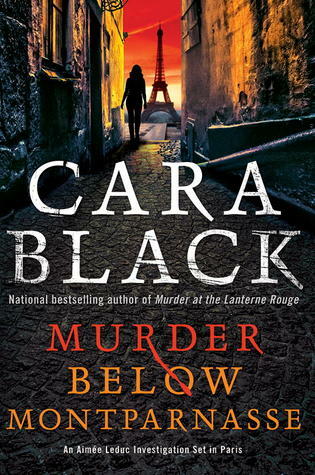 In this, the 13th mystery in the series, Black mines the history of Montparnasse in the 1920s and ’30s as a milieu of poverty-stricken artists and political exiles. As one artist said, poverty was a state to be desired; cafés and restaurants were replete with art traded for food. The crimes committed in contemporary Montparnasse center on a painting possibly done by a then-poor artist, Modigliani, of a then-unknown exile, Lenin. Now, the probably priceless painting brings out a passel of crimes – theft, fraud, murder – and Black’s protagonist, Aimee Leduc. She’s the owner of Leduc Detective, and a master at solving the crimes in 12 previous arrondissements. There is one crime, however, that she cannot tolerate, nor solve – a fashion faux pas. “ ‘Brown—the new black?’ ” she comments about a young woman all in brown, “…which only highlighted her already mouse-like appearance.” Aimee wouldn’t be caught dead – literally – wearing the wrong outfit. Without a hitch in the narrative, Aimee slips into black for a stakeout, then into a little leather for a visit to a lesbian bar. She’s as likely to worry about a lack of mousse in her hair as she is about a lack of clues. Fortunately for the reader, her attention to haute couture doesn’t hamper the action, as Aimee careens down narrow side streets after clues. Some of those clues lead down a very personal passageway to a very personal crime against Aimee – her mother’s desertion. On Interpol’s most-wanted list for a score of years, her mother may be behind the murders. The fast-paced chase for the painting, coupled with complications in her love life and the loss of her business partner, leads to a surprise confrontation with her mother, and a surprise denouement that promises to come to fruition in another arrondissement in the near future. This entry was posted in Mysteries and tagged Cara Black, Mystery. Bookmark the permalink.